Several years ago I spent a great deal of time listening to the radio station found on the band Broadcast's website. I jotted down all the songs that really inspired me and added them to an ever growing list of records to track down for myself. Basil Kirchin ended up at the top of this list. I finally found the CD via Other Music but I think you might be able to still buy it directly from the label. 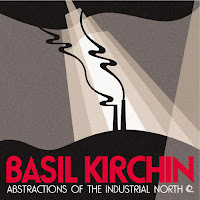 "At long last one of the most beautiful period Kirchin recordings is available. Never commercially released before this is Basil Kirchin in his "imaginary film" period. In other words it;s library music, but not as we know it. I cannot stress enough how awesome this album really is. The history of the music is simple - originally made as a library recording in 1966, it includes guitar work by a pre-Zep Jimmy Page, some sax by Tubby Hayes but names are not important here. The music ranges from blissfully sad to hypnotically weird in a pastoral jazzy odd way. This recording is strangely addictive, so consider yourself well warned. Some have said this is the best Trunk release to date, I am not saying anything. All I will add though is that it's essential and almost too stunning for words. And this CD is very limited. As was the vinyl, which is all sold out now." For more of a backstory on Basil I suggest reading his obituary which offers a rich description of the artist and all of his remarkable accomplishments.